Thread: What did you start with? So I have a practice pad. Er... well I will once it gets mailed. It'll be great to start with but how do you start when you have no clue what you're doing? And where do I go from there? What did other people start out playing? Any tips on good newbie drumming websites? Guidance needed. Trombone in grade school band. Tambourine in a pentecostal church. By the time I was 11, I kept time just as good as any drummer. It gave me a great sense of feel for the beat. My dad played guitar, so it was just a natural thing for me to pick up some of that too. My first drumset lessons happened when I was 14. And for two years I had free use of a 1967 Rogers Dayton Holiday set in Sparkling Blue Pearl, 20-12-14, with matching Luxor 5x14 snare drum. When I was 19, I bought my first set. They were Rogers. I still play them. I started with a no-name brand that eventually was actually falling apart. Upgraded somewhat sideways to a Percussion Plus set, taken very good care of it if you ask me. Then I bought a PDP X7, really it was a test to see how many drums I actually used every time I was playing, an expensive one that almost payed off when I sold it to a friend. And soon I will be playing a Pearl Reference, can't wait. Some random brand called an ION. It was awful, after 3 months the cymbals had corroded to the point that playing the hi hats for more then 10 seconds caused them to pop inside out. I also did that to my crash when I was disassembling it and kicked it onto the floor; for lulz. I can't stress how much I agree with drummer on getting lessons. 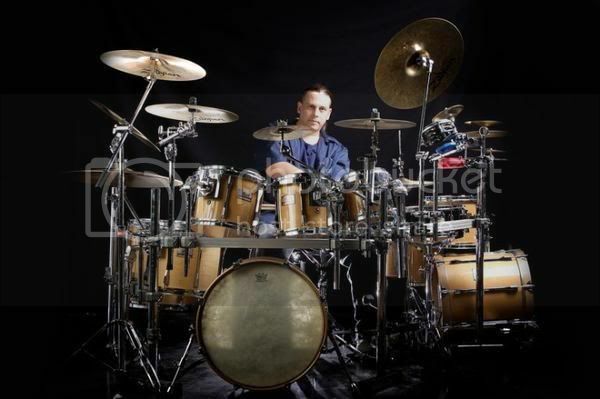 I had no idea what to do for six months before I really got into drumming; I was sloppy but I understood how to get a little better, and then my lessons kept on expanding the way I saw drumming with rudiments and so on. Get yourself a book/copy of Rhythm/Modern Drummer (they usually have sheet music in the back with lessons) and work hard at what it's got, slowly at first. Listen to music and play along with it; it doesn't have to be perfect, it just has to fit the groove. As your perspective on drumming grows, so will your understanding of it, and soon you'll be able to work out how a drummer is getting that sound out of his kit. MW, I thought I should make note here that when you picked up the sticks at the house, you sat down and played perfect triplets! What you had trouble with was quarter notes and 8th notes. Also you hold your sticks in the traditional manner, as a left-hander, even though you are right-handed. I found that very interesting. If you can learn to hold the sticks in the right-handed traditional, and even matched grip manner (you'll learn what that means very quickly), and keep the left-handed traditional grip as something you do, you will naturally strengthen both hands equally, which would be a big plus! I will also get you a good book with a CD/DVD to work with. too funny saturn, i started playing at 13 on vhs cassette tapes (meaning i set up a vhs tape for each drum and hit the tapes with sticks) along to a smashing pumpkins live in germany bootleg video. It worked at the time but I destroyed my movie collection rather quickly! Then got a cheapo "Maxx" drum set a few months later and upgraded to a 1969 Ludwig a year later. I started January 11 2008. A metallic blue 5- piece Ludwig Accent Outfit and a Zildjian pack With a crash/ ride a crash and some hats. Lessons are a noted must. Thanks for all the help. Is it weird to be right handed and yet feel comfortable drumming goofy handed? I agree, I am one of those odd folks that eat, write and drum left handed but do everything else right handed. I am for all intent and purpose ambidextrous but favor one hand over the other depending on the activity. I have actually taught myself to write right handed about as good as I do left. I golf and Bat right handed and catch left handed and throw right handed in baseball. follow your inclination and play what ever is comfortable for you. And lead with whatever hand feels the most natural to you, there is no reason to fight it. I had no idea what a drum sounded like in person when I bought my first set... Which is the one I have now, but I can play lol. Gretsch Catalina Birch. i started playing snare in 8th grade then i got my first set in 1998, it was a 7pc yamaha kit that was a really nice kit but i fell in love with a tama set at a local drum shop and saved my money until i could buy it, ive been playing it since 2000 now. I played too many snowboarding video games. When you snowboard with your right foot in front it's called "goofy footed". And you're right DC my dad could definately help. Maybe he can send me some email videos with some drumming tips in exchange for some Krissy videos. Your dad is having lessons,[and doing real good] so anything he passes on to you is good. I know I thought my old man was full of it , but dad know's best in this instance. you could also get a few lessons and blow him away in a couple of years!!! watch out bob, there's a new sherrif in town. i started playing at 10yo on a remo pts kit and noname cymbals that my cousin gave me. when he took it back a couple months later, i got a beat up dbl bass rogers kit and some cheep zildjian scimitars. that lasted me until i got my tama camco kit and some paiste colorsounds and rudes at 16. This is what I started with, used it for about 6 months before I got my e-kit. Drum chick, you can do a whole lot with that right there. That is all you needed to learn basic coordination exercises. You probably have better technique than a lot of other new drummers starting out, because you started on that little kit right there. Last edited by backtodrum; 02-12-2008 at 04:33 PM.